Seaford is blessed with a beautiful seafront that sweeps around the bay; encompassed by the striking presence of Seaford Head and the cliffs on the eastern side and Newhaven Harbour with Mount Pleasant in the distance on the western side. Pictures courtesy of Kevin Gordon. 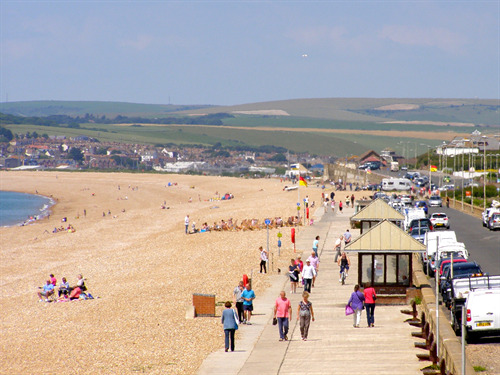 The seafront is jointly owned and maintained by Seaford Town Council, Lewes District Council and East Sussex County Council. The Environment Agency carries out the reprofiling of the beach twice annually (replacing shingle that has been swept out in to the bay) as the beach acts as a key flood defence for the residents of Seaford. Seaford seafront is not commercialised and some may say this is its beauty. With the town centre less than a five minute walk away and the exciting projects to come from the Seafront Development Plan, you will not feel a lack of services. The seafront is home to an RSPB viewing point for the Kittiwakes at Splashpoint, two miles of undisturbed shingle beach (popular with families, fishermen and water sport enthusiasts), a promenade for relaxing walks or bike rides, Martello Tower which houses Seaford Museum and stretching round to Tide Mills at the far western end of the town which are the ruins of an old milling village. 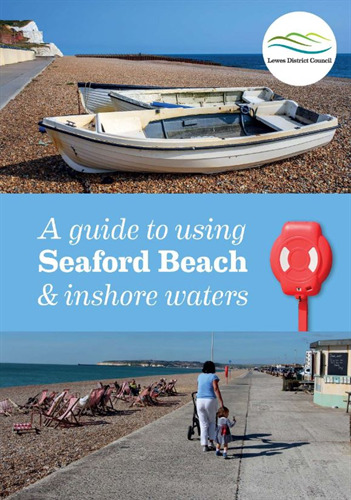 Seaford Town Council and Lewes District Council have worked with the voluntary Seaford Lifeguards to rejuvenate the Guide to Seaford Beach & Inshore Waters. This is now available to download by clicking on the image to the right or hard copies can be obtained from the Lifeguards themselves, who patrol the beach every weekend day during the Summer months, or from the Tourist Infomation Centre on Church Street in Seaford. 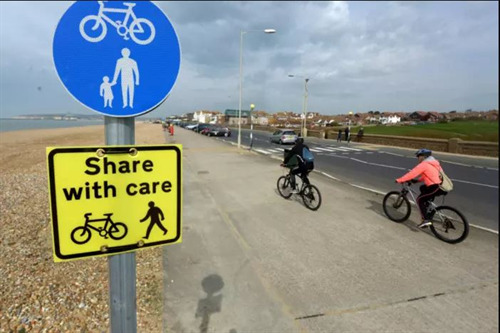 Seaford seafront offers a Share with Care cycle scheme, where walkers and cyclists are encouraged to use the promenade together. There is clear signage along the promenade to guide cyclists and walkers alike to help ensure everyone has a safe and enjoyable experience. 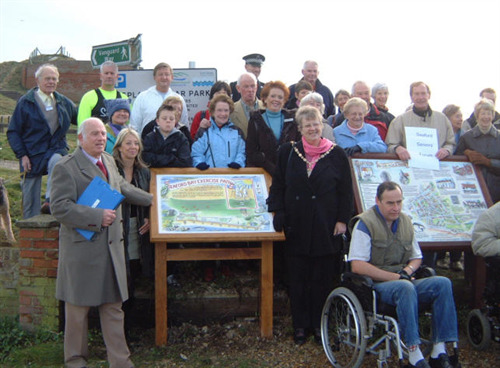 Seaford Community Partnership created an exercise path leaflet, with support from the Council. The Seaford Bay Exercise Path starts at Splash Point and covers a distance of five miles taking walkers, joggers and cyclists on a round trip from Splash Point, along the Promenade and through the historic remains of Tidemills. To download a copy of the leaflet, please click on the image to the right or visit the website www.seafordheritagetrails.co.uk , which also has details of other local walks in the area. 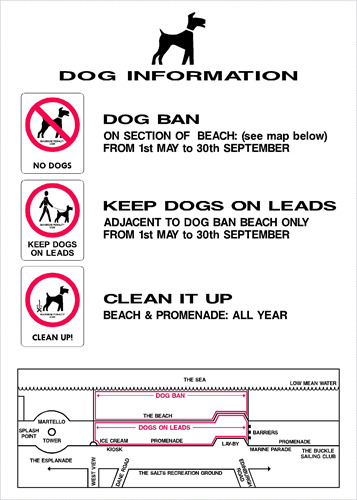 Visitors to Seaford seafront should be aware of the Dog Ban bylaws that exist along parts of the seafront, please click on the image to the right to see the poster in more detail. Lewes District Council operates the Dog Wardens within the area so any concerns regarding dogs on the beach should be reported to them on 01273 471 600. For hot/cold drinks and a variety of food, located just off the seafront in the Salts Recreation Ground, with bistro style seating and the nearby playground and recreation ground. For hot/cold drinks and food, located between the Martello Tower and the Salts Recreation Ground, with plenty of seating and a sand pit to keep the kids happy. For hot/cold drinks and food, adjacent to the Martello Tower with ample parking nearby and plenty of seating on a decked area of beach. 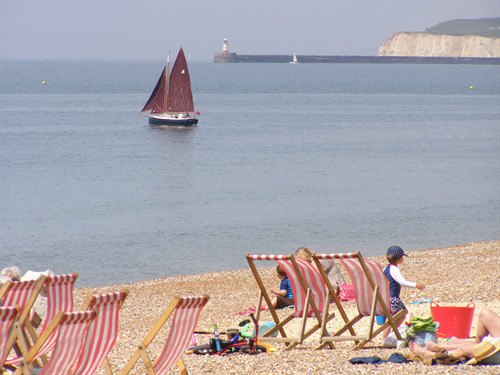 A café within Newhaven & Seaford Sailing Club, at the far western end of the seafront, with ample parking nearby at the Buckle Car Park and boasting a range of homemade food and plenty of seating. There are concession leases for Ice Cream Vans at splashpoint (the far eastern end of the seafront, at the base of Seaford Head) and at the eastern end of Bönningstedt Promenade, in the parking area. There is also The Salty Seahorse, providing gourmet fish and chip options, located on Bönningstedt Promenade and La Creperie, serving freshly made authentic crepes, on the promenade at the end of Dane Road.